To launch the first month of Fine Dining & Breathing, two editors from the Paw Print and I decided to visit Plainfield’s Delight, located off 119th street. This family-friendly restaurant serves a wide variety of homestyle breakfast food while also serving a wide variety of Greek specialty dishes. Whether foodies crave breakfast, lunch, or even dinner, Plainfield Delight has it all. Décor/ Atmosphere- (James) After walking in, we were immediately greeted by a friendly host who appeared to look grateful with our business. He had an inviting grin on his face and was eager to give us a seat. This welcoming behavior made us feel at ease immediately and made a wonderful first impression. (Emily) First walking into the restaurant, the atmosphere is notably cozy; many cute breakfast-themed pieces of décor show off the restaurant’s homeliness. Food/ Review (James) Soon after panning through the five-page menu, I ordered Olga’s Fruit & Yogurt Crepes, with a cinnamon roll as my side. For my drink, I decided to go with their complimentary black coffee, with two half and half crème with sugar. I was very disappointed with the coffee; it held a weak flavor and I could tell they barely put coffee in the machine. The temperature also gave it had been sitting for a while. The cinnamon roll was brought out immediately after ordering it. The roll itself was very soft and chewy, and it almost tasted like a homemade roll. They were very generous with the frosting, not to the mention it melted with the roll’s “out of oven” temperature. With a school lunch being the only thing I ate that day, it was nice and fulling for an appetizer. (Bella) At Plainfield’s Delight, I ordered an item from the lunch menu for my meal. I ordered the Bacon Cheddar Burger Deluxe for $10.99. There is a plain option, where the meal is only the burger while the deluxe comes with two sides. Out of the many side options, I chose French fries and a fruit cup. The burger was delicious. It was very juicy and had just the right amount of cheddar cheese. I had ordered it to be cooked medium rare. It came served on a sesame seed bun and included lettuce, tomato, and pickles, on the side. I chose to have lettuce and tomato on my burger, as well as a quarter sized amount of ketchup. The burger reminded me of the ones served at Red Robin, but the restaurant had a family feel to it. As for the sides, I only received one of the two. My burger came with the fries I ordered, but I did not receive the fruit cup. While I was shorted a side, I was not too upset because the burger and fries were filling. The fries were very good and weren’t too salty. 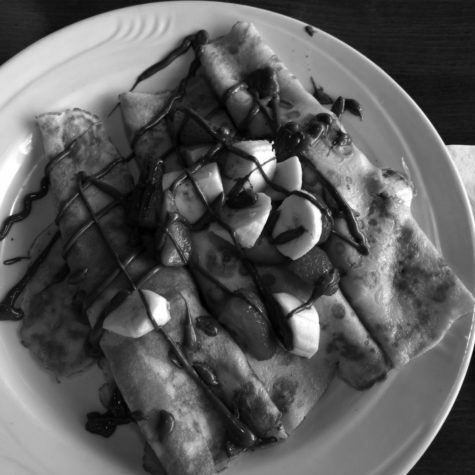 (Emily) The Nutella Crepes were surprisingly filling. With three crepes both filled and topped with Nutella, strawberries and bananas, it was difficult to finish the entire thing. The bananas and strawberries were perfectly ripe and filled the entirety of the crepes; they were almost overflowing with fruit and Nutella. For its low price, it was worth the money. (James) I ordered the Olga’s Fruit & Yogurt Crepes. They were to die for. The crepes were smooth and buttery, the type of crepe that doesn’t need syrup. On the inside, they were stuffed with strawberries and bananas, with a sweet yogurt on top. Not to mention they topped the crepes with even more fruit. The strawberries varied between tart and sweet, which gave the crepes a different yet tasty combination each time. Everything was fresh, and the service of the restaurant was quick. (Bella) Overall, Plainfield’s Delight offered delicious food for a decent price. I would definitely go again and recommend to a friend. I’m giving Plainfield’s Delight four out of five stars. (James) Our waitress for the afternoon, Christi, was quick to answer once it came to asking her opinion on the various dishes. It was obvious the staff there hasn’t changed over the years, and every member follows an example of kindness and humor. Besides the weak coffee, Plainfield Delight was delightful as ever. I would rate Plainfield Delight a steady 4/5 stars. Our group average rating for Plainfield Delight was a solid 4/5 stars. Nutella Crepe and Bacon Cheddar Burger stood out to the journalists.